The center of every parent’s world is their baby and every smile, gesture or action is important. And one of the primary needs of a child is to be fed. But few parents know that some kinds of feeding, particularly long-term bottle feeding, can come with risks to a child’s dental health. Cavities in infants and toddlers are often called baby bottle tooth decay. Baby bottle tooth decay usually occurs in the front teeth, though the back may be affected. This decay begins with cavity causing bacteria being passed from caregiver to infant. Prolonged exposure to sugar and putting the infant to bed with a bottle, feed that bacteria and increase the amount of decay in their mouth. If baby bottle decay is allowed to advance, it can have dire affects on an infant’s dental health, and their dental health in the future. At Mayfield Dental Care, we want every parent to know what baby bottle decay is, its symptoms, and how to deal with it. Baby bottle tooth decay is caused by frequent and long-term exposure of a child’s teeth to sugary drinks. These drinks include milk, formula, fruit juice, and soda. The sugar in these drinks puddle around young teeth and gums, feeding bacteria that leads to plaque, acid, and eventually tooth decay. Baby bottle tooth decay is associated with breast-fed infants with prolonged feeding habits and children whose pacifiers are dipped in sweetening agents. Who Cares If Temporary Teeth Are Lost? While it may seem silly to worry about saving teeth that are sure to be gone in about 6 years or so, your child’s baby teeth are actually important to dental health. Proper chewing and eating: Digestion of food begins in the mouth. Chewing breaks food into digestible sizes. If your child has a painful mouth, they may only eat soft, medium-temperature foods, possibly eliminating healthy foods from their diet. Baby teeth help shape your child’s speech. Forming and pronouncing words correctly is highly dependent upon regularly spaced and healthy teeth. Early loss of primary teeth can lead to speech impediments such as a slur or lisp. And when these bad habits are learned early, they are difficult to overcome. In severe cases, speech pathologists may be needed to restore normal speech. Save space in the jaw that is needed for proper development of adult (permanent) teeth. Your child’s temporary teeth “hold the space” for permanent teeth. If the temporary teeth are lost too early, the permanent teeth may have difficulty erupting, or come into the jaw at a bad angle. Self-esteem: Missing teeth, poor speech habits, misaligned permanent teeth, and other conditions can adversely affect the self-esteem of your child. Baby bottle tooth decay commonly occurs on the upper front teeth, although it can take root in any tooth. Symptoms include unusual white, dark, or brown spots on the teeth. Teeth may also more sensitive than usual to hot, cold, and sweet. Don’t share saliva with your baby through feeding spoons or licking pacifiers. After each feeding, swab your child’s gums with a clean, damp cloth. When your child’s teeth come in, brush them gently with a small toothbrush and a dab (or pea-sized amount) of toothpaste. 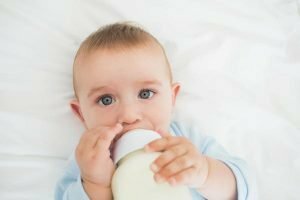 Your child’s bottles should only contain formula, milk, or breast milk. Don’t fill bottles with sweet liquids such as sugar water, juice, or soft drinks. If your child requires a bottle, consider filling it with water. Infants should finish their bedtime and nap-time bottles before going to bed. If your child uses a pacifier, make sure that it is a clean one— and don’t dip it in sweetening agents like sugar or honey. When that first tooth appears in your child’s mouth, talk to us at Mayfield Dental Care about a first dental visit. A first dental visit is an investment in your child’s future health! Remember: beginning early is the first step towards a lifetime of good dental health. For more information about nutrition and your baby feel free to consult with us here at Mayfield Dental Care. Mayfield Dental Care provides excellence in dentistry with the slogan, “Customer satisfaction must be our top most priority”. Our guiding principles are innovation, culture and care. Our equipment is cutting-edge and our outlook is forward-looking to provide you the best dental experience you have ever had.